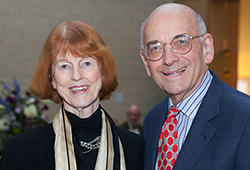 They've been married for 19 years, but Rosemary A. Stevens, Ph.D., ('73) and Jack Barchas, M.D., ('81) have been members of the National Academy of Medicine, even longer. They recently decided to each designate a bequest from their estate to the NAM. "It's a very special organization with a unique role  not just in American medicine but American society," said Stevens. "I've been involved in the NAM for over 40 years. We have a commitment to this institution because of its role in serving the public." "[The NAM provides] a truly nonpartisan way to look at issues with the very best advice that can be given," added Barchas. "It was extremely important decades ago, but it's even more important now." Both Stevens and Barchas count their volunteer service for the NAM among the most rewarding of their careers. Stevens served two terms on the NAM Council and has chaired or served on several NAM study committees. Barchas also held NAM leadership positions, and his committee work included chairing an influential study on research in mental health and substance abuse  a report that culminated in doubling the budget for three agencies in the National Institutes of Health. Stevens and Barchas are particularly interested in using their estates to support NAM dissemination efforts. "The [NAM] needs to be able to use internally generated funds to really be independent and do studies that might otherwise not be done," Barchas said. "If each of the members gives something, it can really add up."